This family run inn and country hotel boasts both boutique style rooms and luxury bedrooms with four poster beds and whirlpool baths. Choose from a traditional carvery in the bar or a meal in our 2 AA Rosette restaurant. 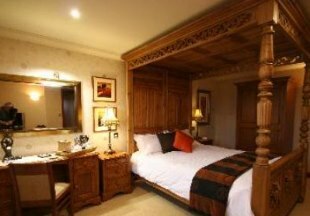 Situated on the A53, 2 miles from Leek, on the edge of the Peak National Park. 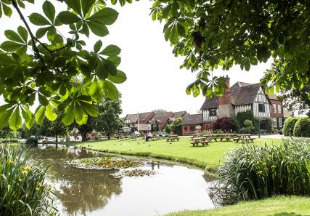 This Grade II listed moated manor house hotel enjoys a spectacular canalside setting in the heart of rural Staffordshire, close to junction 13 of the M6. The hotel boasts an award winning 2 AA Rosette restaurant and traditional brasserie bar. This 18th century, Grade II listed hotel serves local Staffordshire cuisine in its fine dining restaurant, and offers bright and airy en-suite bedrooms with original features such as wooden beams. There is also a spacious bar and terrace. 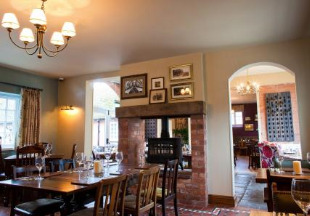 The inn is situated in the quiet village of Brewood, 8 miles from Wolverhampton. 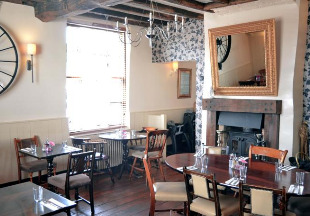 This historic old coaching inn stands in the centre of the lovely village of Hamstall Ridware. 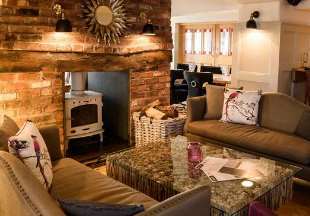 Join the locals by the fire in the friendly bar, enjoy a good meal and then retire to one of our four comfortable en-suite rooms. 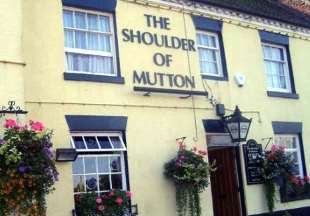 This lovely 17th century inn is situated in the village of Penkridge, just 5 minutes drive from the M6 motorway. All the stylish bedrooms boast en-suite faciltiies, and a contemporary British and Mediterranean menu is available each evening in the restaurant with its original fireplaces and oak beams. Wolverhampton city centre is 20 minutes drive from the inn. Welcome to the Wheatsheaf at Onneley, an 18th century coaching inn with ten comfortable en-suite rooms. Dine in the stylish restaurant and bar area, or on warm sunny day, enjoy a meal al fresco in the pretty garden. A newly renovated country inn in the village of Sandon, 5 miles from Stafford. Guests can enjoy home-cooked food served throughout the day by the real log fire indoors or outside in our stylish garden on warmer days. 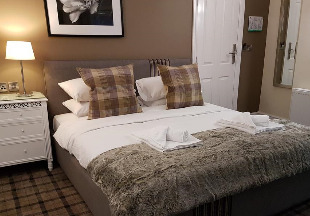 The inn also boasts individually designed en-suite bedrooms and is just 30 minutes drive from Alton Towers and Uttoxeter Racecourse. Free parking is available. Welcome to Staffordshire in the heart of England. Not often thought of as a destination, until you remember that Staffordshire is home to that Mecca for thrill-seekers, Alton Towers, and also includes part of the stunning Peak District within its borders. Staffordshire is also home to 'The Potteries', the area around Stoke-on-Trent where pottery such as Spode, Wedgwood, and Royal Doulton has been produced for centuries. Whether you are on business, breaking a long journey or looking for a weekend away, take time to browse our selection of hotels and inns in Staffordshire. Avoid those corporate concrete-and-glass motels and hotel chains and seek out a friendly inn. Often much better value for money, country pubs and inns offer a friendly atmosphere, great food and drink, and can make a routine trip into an event to remember! "Why break a long journey in a featureless motel, when just off the motorway you can find excellent country inns offering great value food, drink and accommodation? The 17th century Littleton Arms is just a short drive from the M6; best to book dinner at this popular inn, the food is excellent!" Staffordshire is bordered by Shropshire, Worcestershire, West Midlands, Warwickshire, Derbyshire and Cheshire. If you want to widen your search, why not browse through our selection of hotels and inns in Shropshire, Worcestershire, West Midlands, Warwickshire, Derbyshire and hotels in Cheshire.